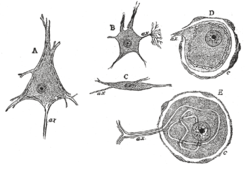 Various forms of nerve cells. B. Small multipolar cell, in which the dendrites quickly divides into numerous branches. 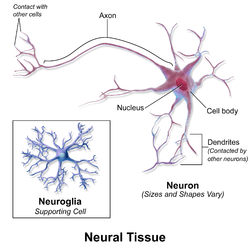 A multipolar neuron (or multipolar neurone) is a type of neuron that possesses a single (usually long) axon and many dendrites, allowing for the integration of a great deal of information from other neurons. These dendritic branches can also emerge from the nerve cell body. Multipolar neurons constitute the majority of neurons in the brain and include motor neurons and interneurons.It is found majorly in the cerebral cortex.